Congratulations, America. 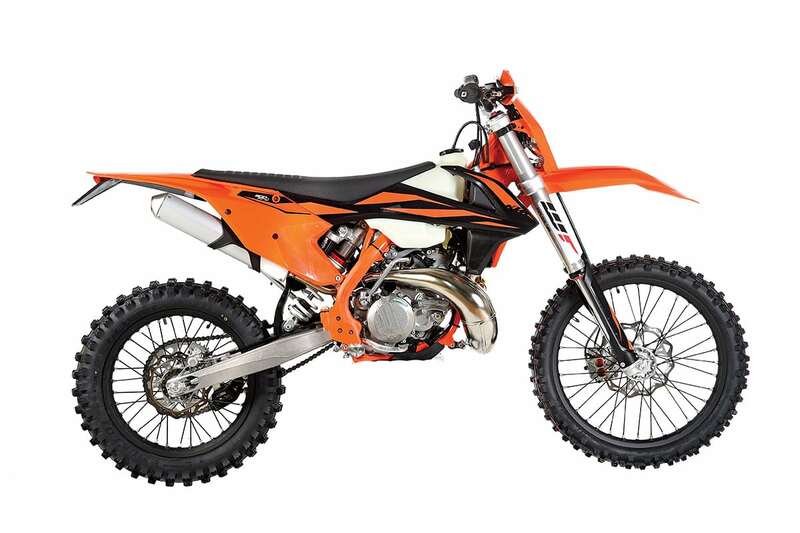 We finally got the KTM 300XC-W TPI this year. It’s been in Europe of over a year, while we got only a limited run of the 250 version. We’ve been hearing about Jonny Walker calling the 300 a cheater bike. 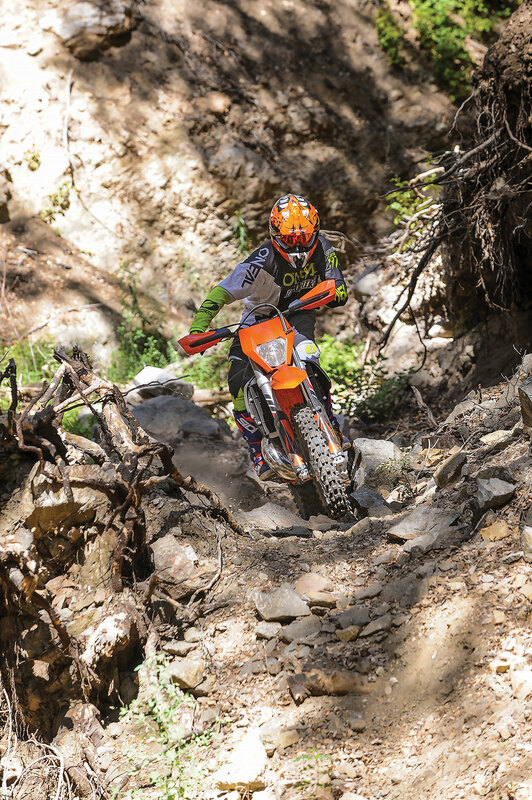 Cody Webb has won or chewed at the gold for almost a year on one, and in the extreme enduro arena, every top KTM (and Husky) racer chooses to run the fuel-injected 300XC-W TPI. Slim ergonomics, a 2.4-gallon tank, a nice side stand that tucks up and a tidy plastic skid plate mate to ODI grips (nice! ), Neken bars, good hand shields and a side-access air filter. Although this fuel-injected machine runs cleaner than any carbureted machine, it is not approved as an EPA-legal machine. It was developed to meet the strict Euro 4 standards. This closed-course machine uses the same 72mm by 72mm stroke and bore as last year’s carbureted machine. The power valve is actuated by exhaust gases that force it open as they increase in velocity and push harder against the flap or valve. The goal is to provide the machine with usable power that expands as the engine revs. The cylinder features two lateral domes that hold the fuel injectors and supply fuel to the rear transfer ports. The downstream injection provides proper atomization of the fuel with the upstreaming air. This is where the bike is cleaner, as there is less unburnt fuel, more effective combustion and fewer emissions. The ergos, brakes, clutch ease, starting and smooth performance all make the 300XC-W TPI an off-roader’s dream machine. The 300’s engine management system (EMS) has a control unit that you’ll find under the saddle. This unit ascertains the ignition timing and the amount of fuel injected, which is based on air intake, throttle position and the engine’s fluid temperature. In layman’s terms, there’s no more jetting required to deal with altitude and temperature changes. Like last year’s TPI engine, it’s fit with a 39mm Dellorto throttle body with the airflow regulated by a butterfly that is operated by a normal throttle. A throttle position sensor provides airflow data to the control unit, while a bypass screw allows you to adjust the idle speed. There is a cold start, which opens a bypass supplying more air. Remember, this is an oil-injected machine (no premix), and this means that the crankcase receives zero lubrication. With oil injection, there’s an oil tank (the filler is directly behind the steering head), and oil is supplied from the oil pump and mixes with incoming air to lubricate crankshaft bearings and the cylinder/piston. The oil-injection system is said to reduce up to half of the smoke from the exhaust system over carbureted models and has a capacity of 0.7 liters, enough for five to six refills of fuel. The oil-injection filler sits in between the gas cap and the triple clamps. It holds .7 liters (23 ounces) of oil, which is good for five to six tanks of petrol. 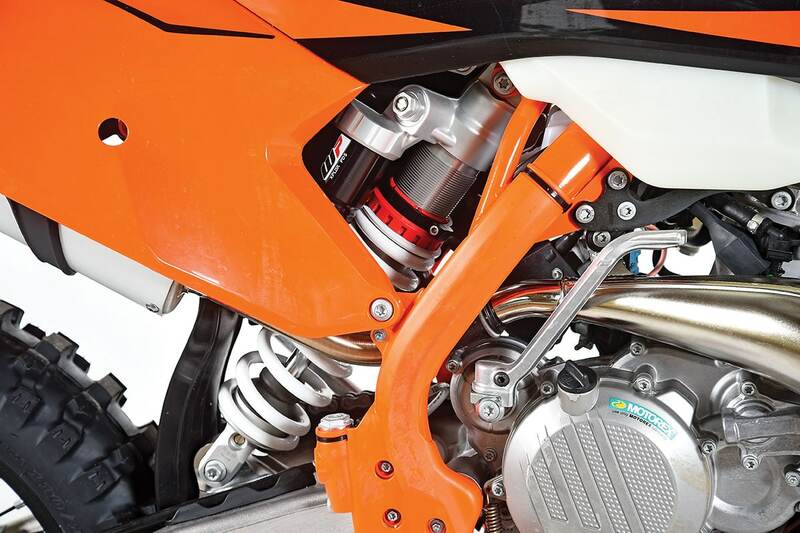 KTM’s triple clamps are super adjustable for riders who prefer different bar positions. With the chassis, there are few changes from last year. 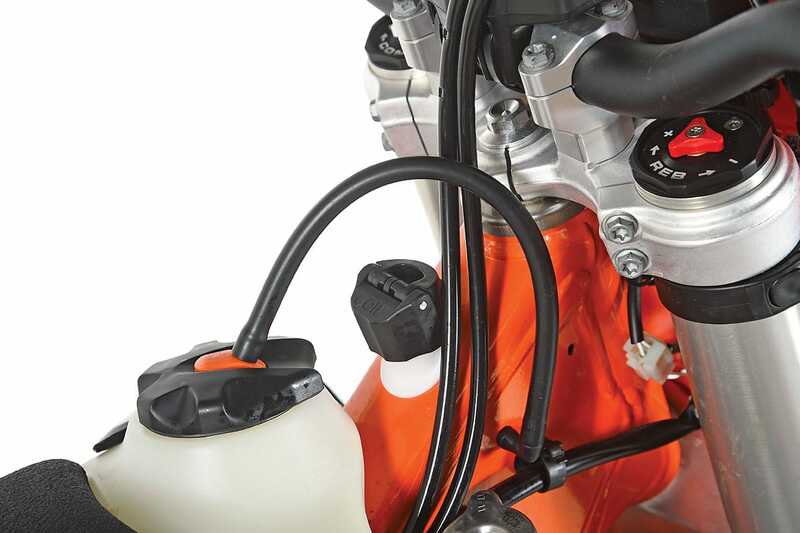 KTM’s XC-W line comes fit with the WP Xplor fork and shock, whereas the XC versions come with the AER air fork, and their rear end runs through a linkage system. The Xplor fork uses springs in both legs, features separate damping functions for each leg (compression: left, rebound: right) and adjustments are found on top, where access and clicks can be altered with a flick of the dial. There are 30 clicks on each damping circuit. This year’s fork has been fit with new valving that wards off the excess dive of last year’s fork and has better resistance to bottoming via the sealed hydro-stop feature. The PDS rear shock comes with a progressively wound spring, and the linkless system is highly touted by riders who opt for technical terrain over higher-speed racing. The plastic preload adjuster is a returning sore point. KTM kept the kickstarter on the 300, though we have never used it. The WP PDS shock mounts directly to the swingarm—again, no linkage. Damping is handled via a dual-piston design that targets a progressive arc to damping curve. A progressively wound shock spring aids in the gradual rise in damping feel and action. There are several advantages to the link-less PDS system. Ease of maintenance (including removal) and ground clearance in ugly terrain are at the top of the list. 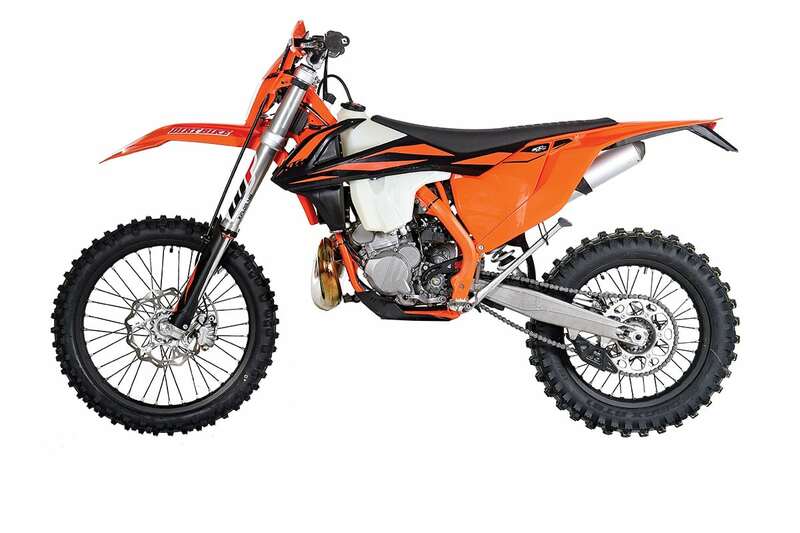 The chromoly steel frame is a KTM tradition and offers proper stiffness and good feel (through energy absorption factors). The frame is super light and uses an aluminum subframe fit with a side-access air filter. The saddle is firm and thin, offering good mobility, and the 2.4-gallon fuel tank retains good lines for rider movement. It carries an integrated fuel pump and a fuel-level sensor that lets you know when things start getting close to the panic level. The wheels are fit with CNC-machined hubs and black D.I.D Dirt Star rims. Tires are Dunlop. AT81s are mounted up both fore and aft. Brembo brakes and Wave rotors handle the stopping duties. On long sustained climbs we got the 300 to boil over. We’re going to install a fan. Both suspension ends are plush, the fork is too divey and riders over 175 pounds will need stiffer springs. The 300XC-W, equipped with enduro lighting, a nice little odometer and a skid plate (a tidy plastic unit), weighs 229 pounds without fuel. That’s about 5 pounds more than last year’s XC-W carbureted model. Starting via the button is instantaneous, and we never had to fiddle with the cold-start button. It feels fairly thin. The ergos are good, and the saddle-height-to-peg relationship is good for an average-sized human. Our over-6-foot crowd felt cramped and moved the handlebar mounts to the forward position to give them a bit more room. The ones with cranky knees screamed for a taller saddle. Right out of the hole, the bike is silky, quick and immediate. There is almost no vibration, and this fact alone makes it feel fast. The clutch pull is nice and smooth, and the engagement allows for good modulation when the terrain gets tricky. It’s crisp, feeling like a spot-on jetted machine, and the transition from roll-on into the mid meat of the powerband is linear yet wonderfully potent. If anything, it feels maybe a skosh lean here, but as you transition into the upper pull, it yanks long and hard. Again, the lack of vibration is huge here! Without belaboring the point, it’s clean. Pulling smartly, it craves short shifting and lugs down, making really nice traction in ugly zones where grip is limited. Stalling was never an issue, and the nastier terrain showcased the strong bottom-to-mid power, which is the heart and soul of the bike. We also did some major-league hill-climbing, and here the bike showed a strong blend of power with enough on top to keep the wheel spinning on sand climbs. It also revealed that the middle goes lean when you drop off the powerband and are forced to clutch it and fight to get the rear wheel to hook up. It’s not a detonation feel, more like a tinny lean spot that you would normally ride around. But, every once in a while, it sits on the only chair left in the theatre. We’re working on a fix here with a programmable ECU, but that won’t happen until next month. We had no drama with shifting. It’s smooth, and the six-speed gearbox has very usable first through fourth gears. Fifth gets taller and sixth is an overdrive. Matted in sixth and you’re haulin’ boots! We stuck with the stock gearing, which is 13/50 and very rarely used first. Second and third are great trail cogs, and with hill-climbing, it depended on the lead-in to the mountain. In the handling department, the 300XC-W TPI is focused yet soft. For the causal trail rider, the suspension is plush. It loves rocks, roots and trail junk, sending little back to the pilot. Faster conditions demonstrate that the Xplor fork is better on the big hits, but it dives and wallows far too much for an aggressive rider. It’s sprung for a 170–180-pounder. Larger riders and high-end aggro youngsters will have to go stiffer. Big guys will need springs front and rear. But, be that as it may, the suspension is balanced and does many things well. We ended up going four to five clicks stiffer on the fork compression, added a quarter-turn to the shock’s high-speed compression circuit and ran the rear sag at around 105mm. There has been a glug of chatter about the pluses and minuses of the PDS rear end. Pundits who push linkage say that the PDS rides too high, won’t squat in successive hits and makes for a springy/floaty ride. On the other side are the off-road aficionados who praise the PDS’ ability to handle rocky terrain far better than any linkage bike. 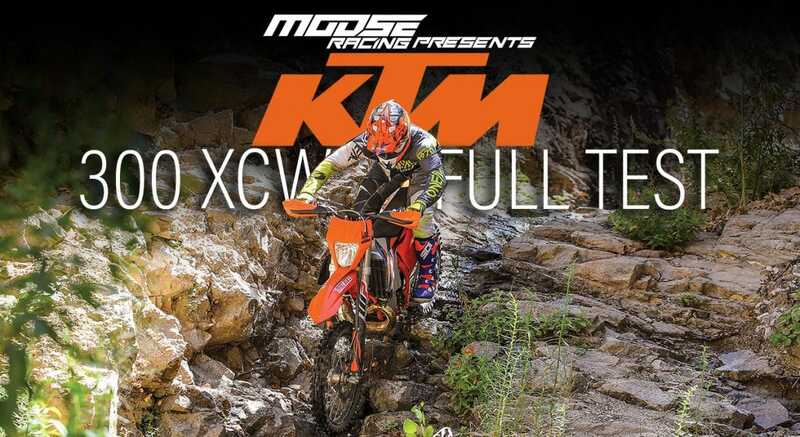 If you look closely at what the high-end KTM racers use, it really depends on the conditions. 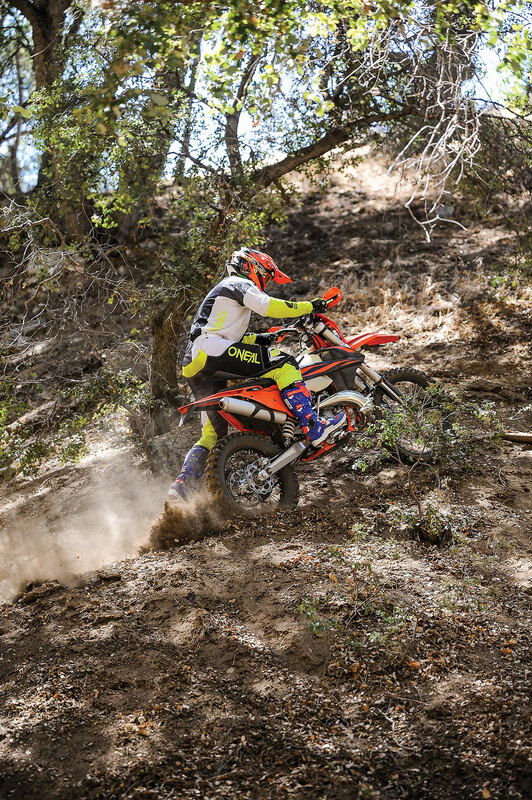 Cody Webb runs PDS on his EnduroCross machine and his extreme enduro 300. Taylor Robert runs PDS on his two-stroke and linkage on his desert machines. Jonny Walker uses PDS technology on all of his extreme racing machines. In our off-road world where our riding zones range from hard and rocky to loose and sandy, the tires play a huge role. In the loose high desert, the Dunlop AT 81 is not ideal. The front wanders and pushes no matter the input. We switched to a Dunlop MX3 up front, and it was wonderful. In the harder-packed, cobby test area, the front AT 81 does a decent job of maintaining front traction. Out back, the AT 81 works nicely in roots, rocks and hardpack. In the loose stuff, it’s average at best. Brakes: Super strong mated to good feel. Love the adjustability at the lever. Footpeg: Nice and wide. Good grip. They’re actually 6mm taller on the XC-W compared to the MX machines. Bars/grips: The ODI grips are excellent. No problems with the Neken bar or the bend. The testers liked it. Again, KTM has good adjustability at the handlebar perches with stock and forward positions, so you can dial in the ergos. Pipe/muffler: The silencer is long, the note quiet and the mounting sleeve is quite cool. We’d like to see a spark arrestor. The expansion chamber is plated and must do a good job with the power, as it’s quite adept. Still, it hangs in harm’s way, and ours has several good-sized dents in it from trail abuse. The starting system is superb. KTM has this dialed in via the lithium-ion battery and a tidy starter motor. Make sure that you use the proper oil in the injection system. It must say two-stroke injector oil or two-stroke oil and injector-friendly. We used Motorex two-stroke oil, which is compatible with oil injection. We are not huge fans of the stock rims. We put several good-sized dings in the back rim early on. Fuel mileage on the TPI is better than the carb machine. We’re getting about 52–58 miles out of a tank, running in the high desert. With the 2.4-gallon tank, we’d start getting nervous at 40 miles. We only got the 300 to steam hard on one horrendously long hill. Still, we’d like to see a radiator fan on it. There is no doubt that if you’re a two-stroke devotee and off-road is your forte, then the KTM 300XC-W TPI is driving the bus to enlightenment. Is it perfect? No. In some applications, the suspension shines, but, overall, we need less wallow and dive and more precision. This doesn’t mean that we want it stiff, just stiff enough to stay up in the stroke and still retain the plushness that a versatile off-roader demands. Power-wise, we’re impressed. It’s strong down low, pulls incredibly clean and yanks on top with a lusty roar. But, it has a small chink in the armor in the midrange where it feels lean. Next month we’ll be testing some ECU mods and will pass this information on, but overall this machine sparkles. It’s light. It handles. It makes brutally effective power, and it’s fun. It gets a big wow.